With songs, chants, poems and dances, Artists For Justice NYC unleashes guerrilla theater performances on unsuspecting audiences around the city. While some of New York City’s activists continue marching in the streets and shutting down roads, others are using a different form of protest to spread the message of the Black Lives Matter movement. Though this collective of visual artists formed in January of this year, many of its members are veterans of New York’s Black Lives Matter movement. After a Staten Island grand jury decided in December not to indict Officer Daniel Pantaleo for the death of Eric Garner, many members of Artists For Justice NYC hit the streets to express their outrage and help raise consciousness. After members began regularly seeing each other at protests, they decided to come together and use their artistic talent to spread the word about police brutality and systemic racism. Armed with an array of politically-inspired songs, chants, poems and dances, the group now unleashes a full set of guerrilla theater performances on unsuspecting audiences around the city. And so far, they’ve been pretty effective at spreading their message. Two days later, Artists For Justice NYC teamed up with another activist group, Shut It Down NYC, and staged a performance in Grand Central Terminal. 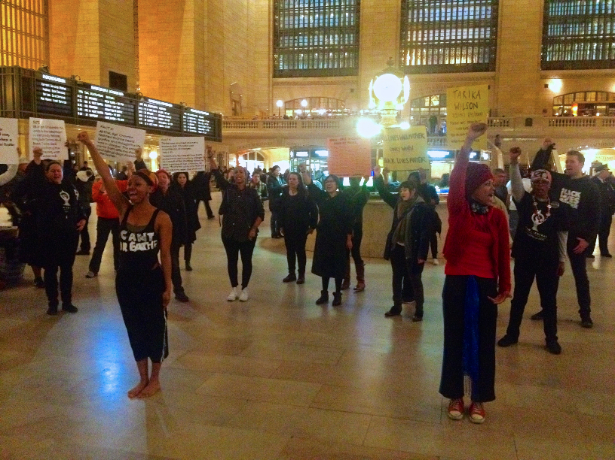 After initially grabbing the attention of onlookers in Grand Central with their act, Artists For Justice NYC made way for Shut It Down NYC members to present the crowd with facts about police violence against black women, as well as the appalling record of violence against people of color by the New York Police Department. This time, the group was able to complete its full set multiple times, and onlookers were still mostly positive. The group plans on engaging in more acts of guerrilla theater in the near-future with Penn Station looking like the next target. They’re also developing a performance piece on mentally-ill victims of police brutality, inspired by the recent shooting of Anthony Hill in Atlanta and other similar cases. And while other activists continue to engage in more orthodox forms of protest, Hardin said that her group will continue to illustrate what a movement with a diversity of skills and talents looks like.